Global Harmony and Woven Chords go back to school! 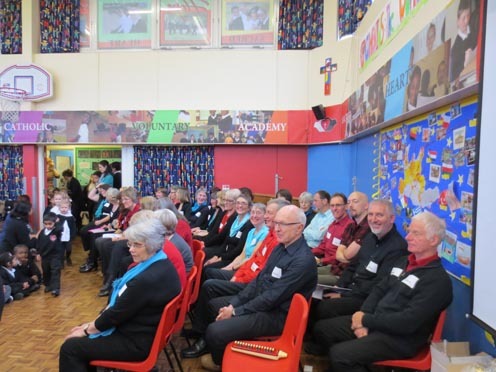 About 30 members from the two choirs spent a wonderful day on Friday 7 February with the children of Sacred Heart Catholic Academy in Leicester for their curriculum day. The children’s objectives were –‘ to be able to sing in unison’ (for the whole school) and ‘to be able to sing in two parts’ (for Years 5 to 7). The choirs’ objectives were – to pass on the love of singing, and, to make it through the day! During the morning assembly in front of the whole school of 400 children and staff the two choirs sang three songs which were met with enthusiastic approval from the packed hall. Choir members were then assigned to a particular class or age group and spent most of the morning teaching the children a song which would then be performed in front of the rest of the school during the afternoon assembly. This was no mean feat since the school is made up of pupils from all over the world and where over 20 different languages are spoken. The children were brilliant and were heard singing – and dancing – to their songs during the morning and lunch breaks! The young ones enjoyed learning the actions to their songs, while the Yr 2 and 3 children managed to do some wonderful two part rounds like Belle mama. Not satisfied with singing in two parts, the Yrs 4,5 and 6 children learned to sing Tuli tuli, Lizela and Noyana in up to four parts – all of which could be heard! The final assembly concert was a triumph for all the pupils and earned them a special badge for having achieved their objectives. The choir members said farewell with a final rendition of ‘Ooh a lay lay’, brilliantly accompanied by the children. It was worth getting up while it was still dark just to see all the happy faces at the end of the day! And we got a box of chocolates each too! After volunteering to spend the day at a school in Leicester I’m sure that most of us did not know what to expect. Probably not to be catching a coach at 6:45 on a wet Friday morning in February. Still, we were all in good spirits as we set off to pick up our friends from Global Harmony in Melton. We had had our warm up session on the coach –all in good voice – and arrived at the academy in time for tea and biscuits in the staff room. After being given our name and bar code security passes we were welcomed by the staff and a given quick run through the day’s agenda. Then it was time to join their assembly, we sat as a choir while the children filed in to the hall, they greeted the headmaster, teachers and visitors – obviously taught how to be polite and welcoming to staff and guests. The days objectives were explained “I can use my voice expressively, I can sing in unison and two parts”. Liz explained how we sang in harmony , we then sang three songs –and received an amazing response from the children, some appeared to be surprised, some were moving to the music and some were trying to sing along- and what an applause- if only our usual audiences were so responsive! Then it was off to work. The choir had been divided in to small groups and allocated a class and songs to teach. I was with Ann and Sue, we were singing with “Hazel” class, Mrs Berol - the teacher and Ms Mehan who looked after the two special needs children. We were introduced and as a warm up and get to know you song we asked the class “have you bought your singing voice” we had some great responses to have you bought your happy, sad , bouncy, squeaky, voices and then the children sang the response “yes we have” not altogether in tune but there were joining in. We then moved on to “Bella Mama” (low part) which was our concert song we had lots of excellent guidance from Mrs Berol who showed on the classroom screen views of the islands where the song came from. We found that by using our hands to indicate when notes were moving up and down the children were learning the tune. Liz popped in and was asked some great questions like “was is it called when you wave your hands in front of the choir” and “how did you get the job”! By break time the class were singing and moving to Bella Mama in two groups. After tea and biscuits- and comparing notes we ran through Bella Mama once more and then moved on to “Ooh a lay lay” this one the children really enjoyed and we were soon paddling and singing together. The choir was then treated to lunch, fish and chips with healthy veg followed by a pudding. - excellent food which the children told us they do enjoy. After lunch we joined Rosemary and Rita with “Maple” class who had learnt the high part of Bell Mama the two classes sang together as a rehearsal for the concert. They did surprisingly well –the signs were good! The whole school then re-assembled in the hall for the concert - they were excited and quite noisy at times but I think seeing the choir respond to the “hands up I want quiet” signal from the head may have helped. Each class then gave a performance along with their choir leaders, starting with the Foundation class (3-4 year olds) up to year 6 ( 10-11) and what performances we were treated to ! They all did amazingly well managing to sing in two, three and four part harmony, plus singing and moving to songs such as “Tuli Tuli “ and ”Lizela”. I believe the Head master and staff were surprised at just how well the children were performing and how much they had learnt in just a few hours. After each song the children were given badges for achieving the day’s objectives. Then a surprise for the choir- as thanks for spending the day with the children we were each personally handed a gift bag which contained a box of chocolates and a hand written thank you note - how thoughtful! So to our final song as the choir children and staff sang “Ooh a lay lay” and how we sang! Again the response was amazing – the whole school singing together - what an experience - what an achievement. Sadly it was time to leave, the children waving and shouting our names as we left the Hall, lots of thanks from the staff, talk of another visit, a staff members wedding! - wow! Altogether an amazing and very satisfying experience, a sense of achievement and feeling we had really connected with the children. They on their part were all well behaved, courteous and vey welcoming - our thanks must go to them and to the staff for letting us share their day. Barrie Brown (a tenor in Woven Chords).